The 2014 Colts Cricket season is starting at Worcester Park Cricket Club (WPCC) with registration evening on the 22nd and 24th of April - that's Tuesday and Thursday next week. There is also free coaching for boys and girls aged 8 to 12 year old (Years 3 to 7) on Thursday evening (24th). See here for more information. The evening will be a mix of games and drills followed by a chance to meet the coaches and find out more about the club. 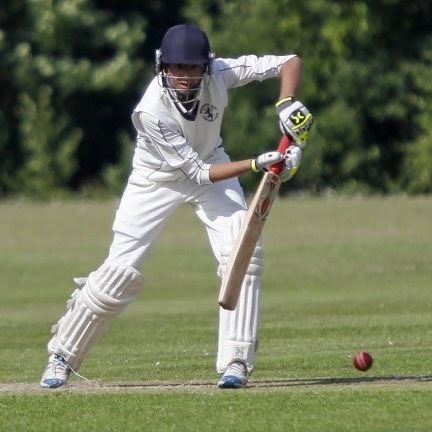 The Colts are WPCC's young people's teams and there are usually around 130 children, from Years 3 to 12 involved with many Senior Colts also playing in the Men’s Senior teams. The Club is certified under the ECB Club Mark scheme, providing a safe environment for children to enjoy playing cricket. They are also a Surrey County Cricket Club Focus Club, promoting cricket in the County and liaising with both Sutton and Kingston Local Authorities. They run 4 Colt League teams, U11, U12, U13, & U14 in the Mid Surrey League to try and give all of the Colts’ experience of competitive cricket. An U9/10 team plays a number of friendly Pairs matches later in the season, and the U16/17s play in the National U17 Cup. ECB qualified coaches provide top class training on Tuesday and Thursday evenings 6.30 – 8.30 at the club (U9 and below 6.30 - 8.00). Most matches are played on Sunday mornings, with U10, U11 and U12s playing some games on Friday evenings. The Colts teams are open to both boys and girls. At present there are only a few girls playing and many more boys but both are encouraged to join up and get involved. Ian Burrows from the club told the blog that while they would love to have dedicated girls/womens teams, at the moment the girls play with the boys on what are effectively mixed teams. He also mentioned that there are some clubs with women playing on senior 'mens' teams where the women do rather well! Registration is at the club in Green Lane. For U13 and older the registration is on Tuesday from 6:30pm. For U12 and younger the registration is on Thursday, also from 6:30pm. You can just turn up and register but you are welcome to telephone the relevant coach to discuss things first if you prefer. A list of coaches and numbers is available on this page. You can download a Training and Behaviour policy document here. You can also download a fixture for the season here. And you can download more information here.